Mercedes E-class information: everything you need to know if you own it, are thinking of buying one or just want to find out more about Merc’s exec. Click on the links below for all of CAR magazine’s news, reviews, videos, scoops and spy photos of the E-class car range. The Mercedes-Benz E-class comes as a saloon, estate, coup or cabriolet – squaring up to the BMW 5-series and Audi A6 hegemony. All four models are a real return to form for Mercedes: quality, style and dynamics to die for. For more information on the Merc E-class, click on our further stories on the links below. The E-class is the linchpin of the Merc range - powering businessmen, taxi drivers and families in the embrace of dependable quality for several decades. The latest model is back on top, after a quality wobble with the 2002 W211 era model. It feels well made and the signs are that reliability is up and gremlins down. Good. That leaves us to concentrate on a large executive car available in a variety of bodystyles to meet your every whim. The convertible has four seats and a slick roof; the coupe a more sporting vibe; but most E-classes are the stock-in-trade saloons and estates. The wagon is huge - its echoing 600-litre boot is beaten only by vans, and that swells to 1855 litres with the rear seats flopped forward. They drive well, focusing on comfort and refinement rather than outright corner-carving. Which is exactly how it should be for a Mercedes. We also love the technology now on offer, including amazing active headlamps which remain on full beam at all times, shielding approaching cars from glare. Pick the E63 AMG bahn-stormer if you want to pose a real threat to the M5 and its ilk. 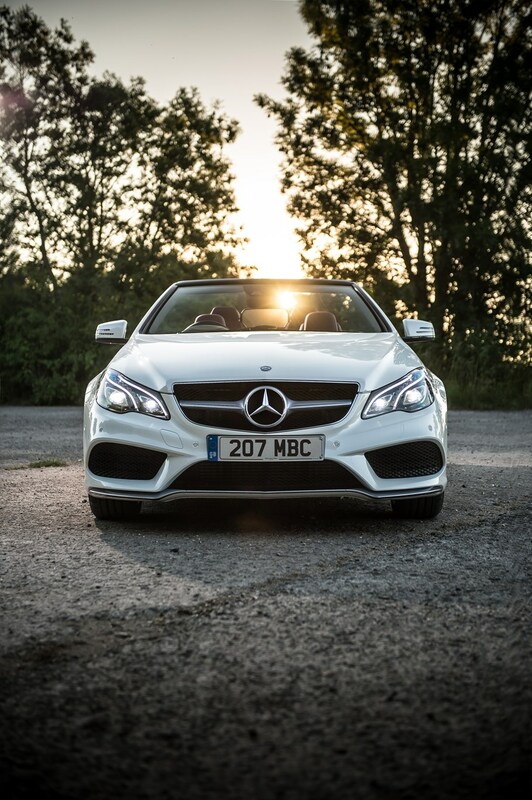 Can Mercedes' refreshed soft-top fend off the BMW 4-series? Is the facelifted E-class better than an A6 or XF? Ben Barry tries out the new twin-turbo 5.5-litre V8. A BMW M3 alternative or a big, comfy cruiser?